WASHINGTON — JACL was among the Japanese American organizations that received a commendation award from the Japanese Embassy on Dec. 16. JACL was recognized for all its hard work in advocating for the Japanese American community and for strengthening relations between Japan and the U.S., especially establishing the Japan Relief and Recovery Fund in response to the Tohoku earthquake and tsunami in 2011. An intimate awards ceremony and reception was held in the Japan Information and Cultural Center. 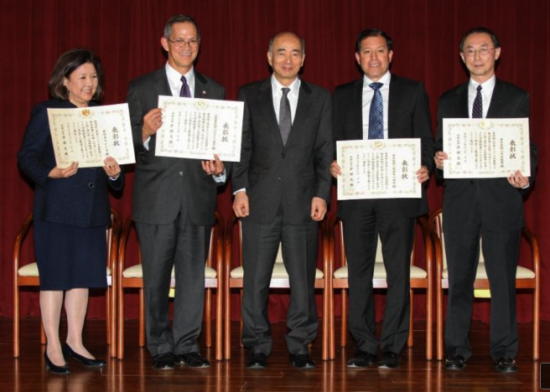 National JACL President David Lin received the award on behalf of the organization from Japanese Ambassador to the U.S. Kenichiro Sasae. This is the first year the Japanese Embassy has given out this commendation in an effort to recognize the accomplishments of Japanese Americans. Also recognized were the Japanese American Veterans Association, represented by Michael Cardarelli; U.S.-Japan Council, represented by Irene Hirano Inouye; and National Japanese American Memorial Fund, represented by Cal Shintani.